Mark Lorch is Professor of Science Communication at the University of Hull. He trained as a protein chemist, studying protein folding and function. His research now focuses on the chemistry of a broad range of biological systems including lipids, proteins and even plant spores. You can find more of his writing at www.chemistry-blog.com, the Guardian and in his The New Humanist and BBC Focus columns. You might also like to check out his book 'The Secret Science of Superheroes'. 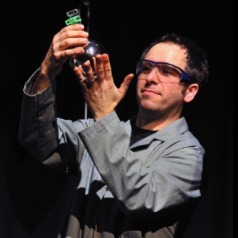 As well as his written out puts he gives regular talks to schools, the public and conferences (sometimes all at once, at science festivals or TEDx) and he occasionally pops up on the radio and TV explaining science and technology to a public audience. Training Scientists to Develop and Image Materials for Tissue Engineering and Regenerative Medicine. Controlling Membranes with Photoisomerisable Lipid Analogues: A Solid State NMR Based Study.